You want great results but you may not be sure which route is going to get you there. Perhaps you didn’t think that choosing a lawn care company in the Lehigh Valley was going to be so much work. We understand that with all of the choices, and all of the information out there, it can be easy to get overwhelmed. But we want to help guide you in making the best possible decision for your lawn so that you will be happy with the service and the results. You shouldn’t have to compromise when it comes to either of these. As you perform some research and look at various companies in the Lehigh Valley, we are quite certain that you will come across Lawn Doctor. Since it’s a company that you might be comparing against Joshua Tree, we thought we’d help get the process started for you. We know that you have probably heard the name. That’s because the company is a national franchise that has been around since 1967. Today, there are more than 500 locations across the United States, including those that service the Lehigh Valley. When it comes to various locations, these are local franchises, run by individual owners. Performing your research on these local branches may be a little bit confusing, as it was for us as we wrote this article. 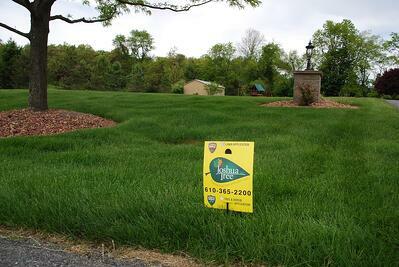 It appears that there is a Lawn Doctor Bethlehem-Hellertown which services the Lehigh Valley. 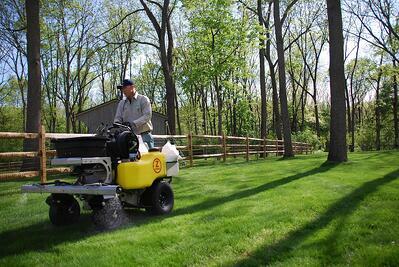 However, Lawn Doctor Warren NJ also appears to service the Lehigh Valley. 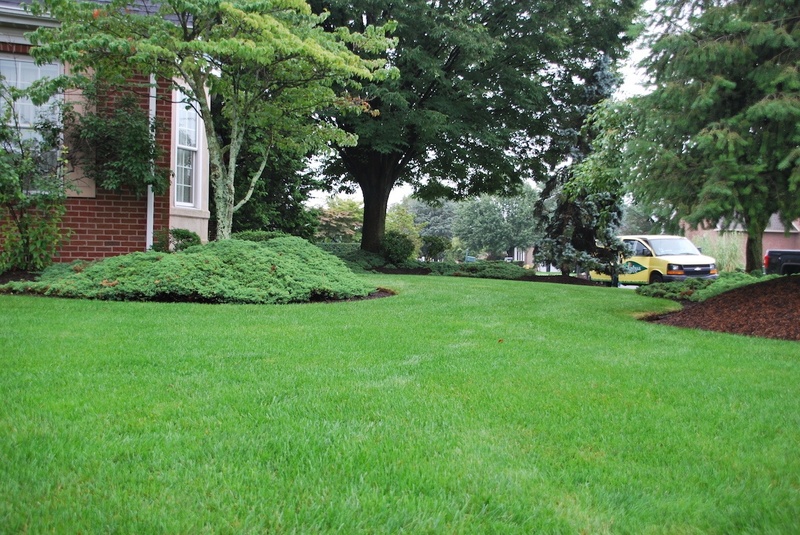 A search for Lawn Doctor Allentown actually takes us to the New Jersey branch. It was a bit unclear to us about how these territories are broken out. Since we suspect you’ll come across both the Bethlehem-Hellertown branch and the Warren, NJ branch (as we did in our research), we’ll just look at both. There’s no question that Lawn Doctor is a big, well-known name. We recognize that big names can carry a lot of power. After all, you probably thought to include Lawn Doctor in your search just because you’ve heard of them before. As a large national company with so many branches, the biggest difference between Lawn Doctor and Joshua Tree is the size of their customer bases and overall operations. If you look at their national coverage, Lawn Doctor services hundreds of thousands of customers across the country while Joshua Tree is solely focused on the Lehigh Valley including areas like Allentown, Bethlehem, and Easton, PA. While their size is quite different, their service offerings share some similarities. At a glance, Joshua Tree offers lawn care, tree and shrub care, tree pruning and removal, aeration, and overseeding. Lawn Doctor Bethlehem-Hellertown and Lawn Doctor Warren, NJ, on the other hand, offer lawn care, tree and shrub care, aeration and overseeding, and outdoor pest control. A big difference is that Lawn Doctor does not have the tree expertise that Joshua Tree has. They also do not offer tree services like Joshua Tree offers including tree removal or pruning. Of course, in order to find out more and to compare these two companies even further, you’ll need to perform some of your own research. With the internet at your fingertips, you have access to a lot of information. There’s no question this can be useful in doing your research and narrowing down your choices, but it can also make it challenging to separate the “good” from the “bad” (or even the relevant from the irrelevant) if you don’t know what to look for or where to look. We’re here to help. After all, we want the process to be as pain-free as possible for you. There are a few important ways that you should research and compare lawn care companies to make your best choice. After you’ve made a list of lawn care companies you’re looking at, take the time to look at each of their websites. Websites are a good place to find out more about the company. Of course, you want to go beyond just looking at a company’s “About Us” page. That’s a good place to start to get the company’s history and find out the basics. But also take time to browse the website and determine what kind of information this lawn care company has to offer. It will tell you a lot about their willingness to be helpful and to communicate with customers. Do they provide regularly updated content, such as blog articles? An effort like this demonstrates they’re not only keeping up with the latest information but they are committed to educating their clients and prospective clients as well. Of course, it’s not enough to just have a blog. You want to look at the actual content that they’re sharing. Are they in-depth articles aimed at helping and educating you or is the company merely trying to sell you on more services (and therefore only serve their own agenda)? You obviously also want to know what you’re going to get for your lawn care investment, so you need to compare lawn care programs. There’s not too much specific information on the programs that Lawn Doctor Bethlehem-Hellertown and Lawn Doctor Warren, NJ have to offer. On their websites, it says that with their annual Fertilization and Weed Plans, your lawn will receive between 6 and 8 treatments that include lawn fertilization, pre-emergent weed control, and broadleaf weed and crabgrass control. This is general information that is found on both of their websites. At Joshua Tree, we have three lawn care programs to choose from, based on your needs. This includes an organic, bio-stimulant granular fertilizer, pre-emergent crabgrass control, a custom-tailored weed control program, free service calls, free follow-up evaluations, lime applications for pH balance, grub control, double pass core aeration, and overseeding. If you’d like to learn more, we have published all of the lawn program details regarding what’s included (as well as pricing) so that there are no questions. We believe in being upfront and clear with this information from the start so that customers can understand exactly what they’re getting. “Social proof” is another comparison methodology that you can use when trying to separate one company from another. This includes referrals and testimonials. Referrals are the references that a company gives you to call or email and testimonials are published reviews of the company, found on their website. Both are helpful tools, but perhaps even more helpful are online reviews. Online reviews help give you a more unbiased sense of what other customers think of a company’s service and their results. Because reviews are published on a third party site, you’ll be more likely to see both the good and the bad. In other words, you’re not just seeing or hearing what the company wants you to. 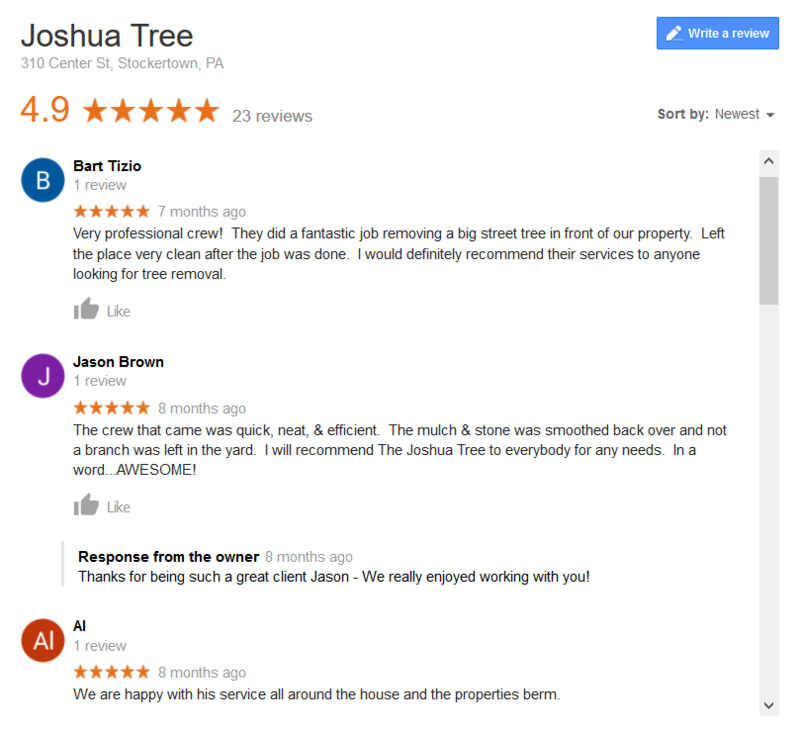 Let’s look at some of the reviews for Lawn Doctor Bethlehem-Hellertown and Lawn Doctor Warren, NJ, as well as some for Joshua Tree. Keep in mind that the number of reviews that a company has is also important. A company may only have a higher rating because they were only reviewed by a handful of people. While there are other rating and review forums, we chose Google, HomeAdvisor, Facebook, and Angie’s List as they are probably the most popular and most frequently used. We commend you for putting time and effort into the search for a great lawn care company in Allentown, Bethlehem, or Easton, PA. We understand that you want to feel confident that you’re investing in a company that you can rely on and that will produce great results. For that reason, you have probably come to recognize that choosing a lawn care company based on the name alone is taking a risk. With such easy access to a wealth of information, you have the opportunity to make a very calculated decision based on a variety of important factors that you can research. That’s how you should ultimately be making your choice. While choosing the right lawn care company is a big decision, we don’t want you to feel stressed about it. That’s why we are here to help guide you through the process. After all, we believe you shouldn’t have to have a degree in agronomy to understand if your lawn is getting what it needs with any one particular program. You can ask us questions and count on us for honest information. Though the lawn care industry has gotten a bad rap for selling customers services they don’t really need, we assure you that’s not how we do business. We’ll give you direct and truthful information, no matter what. When you choose to work with Joshua Tree for your lawn care needs, you get the added benefit of having a company that also has tree expertise and can offer professional services like pruning and removal. After all, you very likely have trees on your property as well and it’s helpful to have the same expert company handle it all. On top of that, when you choose a company that you can trust, you can truly hand over all of your worries with that investment. Instead of feeling like you have to babysit your lawn care company or worrying that you haven’t chosen the right package or aren’t receiving the best services, you’ll feel fully confident that you’re in good hands.